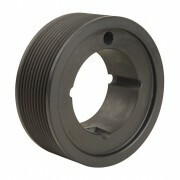 Poly-V or Micro V pulleys are now quite common in Australia. Naismith Engineering can make special ‘J’ and ‘L’ section Poly-V Pulleys from 20mm up to 400mm in aluminium and cast iron. We can also make standard Vee Pulleys for SPA, SPB, SPC & SPZ up to 600mm in aluminium and cast iron.